Images on these pages have been saved at a very low resolution for web display. Actual high resolution images are much sharper and have greater color depth. Copyright notices on some images will, of course, not appear on the purchased image. None of these images is in public domain. 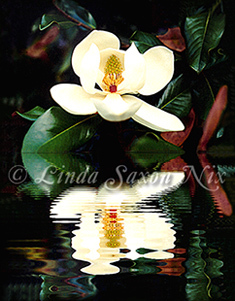 Images © 1999-2006 by Linda Saxon Nix. See copyright notice at bottom of this page. to learn how these images may be used. Nearly opened blossom surrounded by brilliant sapphire jewels of blue sky. Benchmark Magnolia with water reflections based on a water applet. Available as a larger digital image or art print. 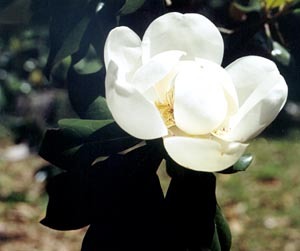 A Magnolia Grandiflora taken at the same time as "Perfection" (just below), only caught with sparkles of golden sunlight dancing in the background between the leaves. Colors are more intense in actual photograph. 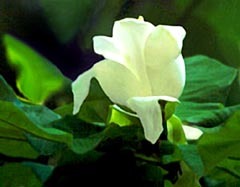 Practically perfect - a symmetrically opened blossom set among beautiful green leaves on a near-black background. 35mm print and negative - art print and digital image. Droplets of water glisten on the petals, while pollen has settled on them like gold dust. A delicate bud amongst rich, green leaves. 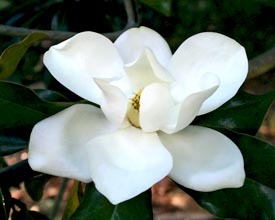 Lovely shaped white tepals surround a lemon-yellow center. Medium Format print and negative - art print and scanned digital image. 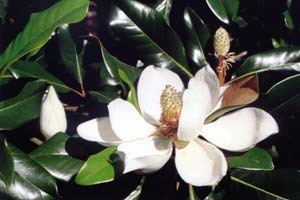 Almost-open blossom of the "cowcumber magnolia"- Magnolia Macrophylia. Leaves are soft and very large. 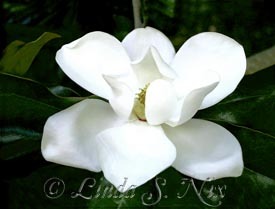 This magnolia sits atop an isolated branch like a halo. Medium Format print and negative and digital image. 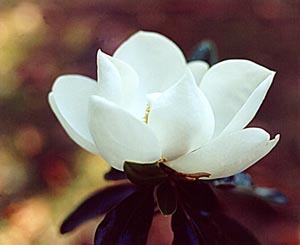 A crystal-clear blossom against a golden background of color. Medium format print /negative and digital image. Medium Format art print and digital image. Medium Format print and negative - art print and digital image. 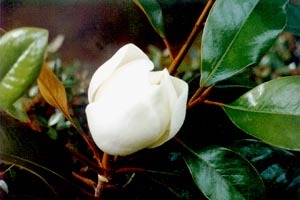 Image from bud to blossom to pod. 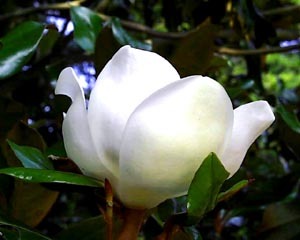 Unusual shaped magnolia with tepals that remind me of a spiraling planet. 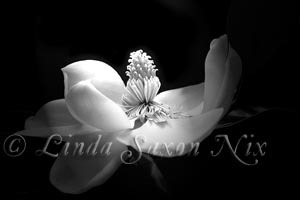 Sensual Black and White image of a magnolia that is perfect as a fine art photograph. 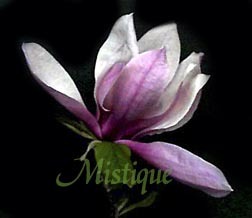 A Magnolia Soulangeana captured on a black background. The quality of the photograph you order or license is much higher than these depicted on this page. All images have been compressed into low-resolution JPEGs in order to allow fast loading; therefore, these images show slight color blurring of solid areas and some colors may appear dulled. 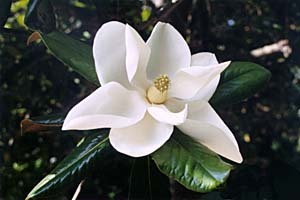 Most Magnolia Images can be dropped out from their backgrounds. The fee ranges from $30.00 - $40.00 per image. Premier Images are priced slightly higher than other images. 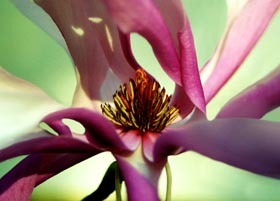 Please note: All of these images is available as an archival photograph up to 13" X 19". Larges sizes available by custom order. you select will meet your requirements for your particular publishing needs. Information on Images for stock, illustration, advertising, web sites, etc. For a complete summary of usage requirements and copyright statements, look Here. 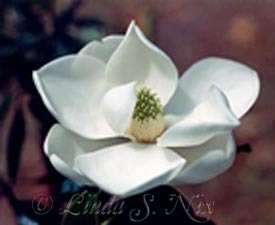 For links to my other magnolia pages, look Here. are allowed only with stipulations in usage contracts. backgrounds, special borders, and, of course, custom sizing. Additional costs may be involved. 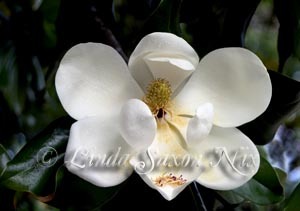 Contact me about usage rights for magnolia images. thus the necessity for this notice. of these web pages is strictly prohibited. 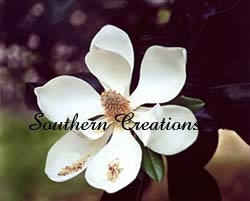 All magnolia images on this page and all other web pages are copyrighted. 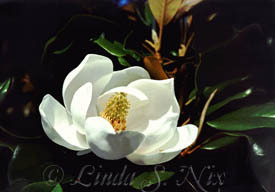 (Copyright 1997 - 2005 by Linda Saxon Nix). please let me know. Unauthorized use strictly prohibited. You may contact me for the rights to purchase the use of an image. Please click on and read the use stipulations below.